Just wanted to introduce the 6-lane 50ft track that belongs to the Diecast Dragster club in West Virginia. We are going to sponsor a stock mail-in race soon. The Diecast Dragster organization also has a demolition derby track coming online so we can possibly do something with that as well. I will add more photos later but here is a video I just finished from this past weekends' events. It looks like the Track Builder packs that were once exclusive to Toys R Us are making their way back into stores. West Virginia's pretty close to where I live, but I'd have to drive over the Appalachians. 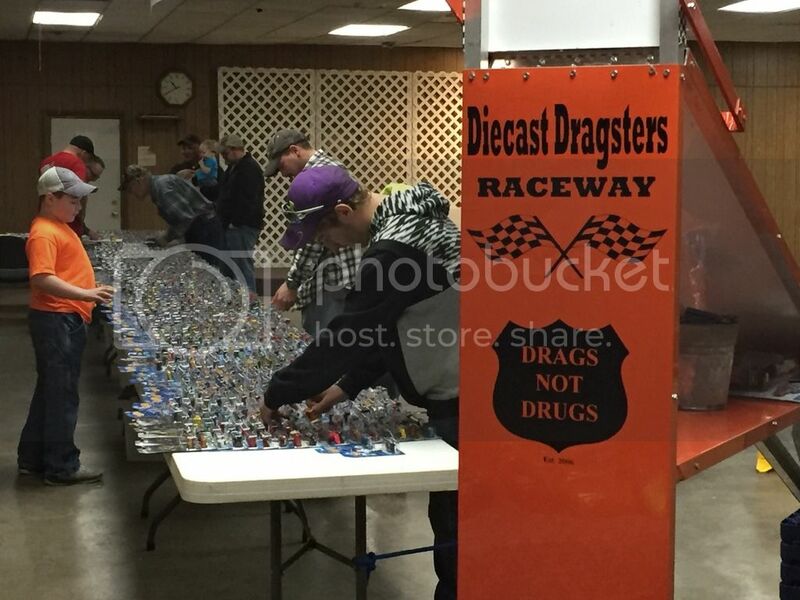 What's the address of Diecast Dragsters and do they meet every weekend? Welcome! Good looking track...those long tracks really sort out the good rolling cars! Awesome setup. Would be great to have that location as a option for future RLD races. Looks like a real nice set-up. I do have a few questions. Is the blue track a little wider than the normal HW track? How high is your drop, what is the degree of the angle and how long is the flat? Made it to the Diecast Dragsters Facebook page and saw this photo...genius idea using the lamp arm to hold the camera (or so I assume). So simple - which is why I probably never thought about that. Really looking forward to our first mail in race, with the help of gtaman it should go well. Dragsnotdrugs above is the owner of this track, he has been running free events I think since 2006, he can answer any questions you may have about the build. Awesome! It's looking very good drag race. I really like the demo wood track..